Johny Hendricks: The People’s Champion? 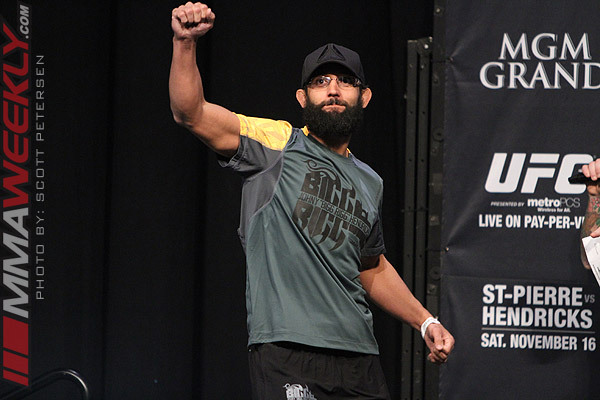 Johny Hendricks entered the Octagon on Saturday night at UFC 167 with one goal and that was to dethrone welterweight champion Georges St-Pierre. While the 30-year-old didn’t walk out with the belt, in the eyes of many, he is the champion. The judges awarded St-Pierre a highly controversial split decision victory with two of them giving him the first round, which ended up deciding the result of the fight. UFC president Dana White was also highly critical of the decision saying that he scored the fight four rounds to one in favor of Hendricks, while most others had it three rounds to two in favor of Hendricks with the challenger winning rounds 1, 2, and 4. White went on to rip on the Nevada State Athletic Commission, saying that the state’s governor, Brian Sandoval, should step in and take control. Some fighters went on to say it was the worst decision in UFC history. One thing is for sure, Hendricks will be determined if the pair meet again after giving St-Pierre the toughest fight of his career. It still remains to be seen when or if the champion will return to the cage, but Saturday night proved that it might not be long until we see a changing of the guard in the UFC’s welterweight division.